When you hear the word "corruption," what comes to mind: Bribery? Dishonesty? Fraud? How about real estate development? Global Environmental Politics Professor and Metropolitan Policy Center fellow Malini Ranganathan has found that in fast-growing cities like Mumbai and Bangalore, citizens are employing the word more and more to describe shady land acquisitions that often leave residents displaced or evicted, or the ecology compromised. As part of an American Council of Learned Societies Collaborative Research Fellowship, Ranganathan is tackling an interdisciplinary research project with urban geography Professor Sapana Doshi from the University of Arizona and literature Professor David Pike from American University's College of Arts and Sciences. Together, they are investigating the use of the word "corruption" in relation to these opaque real estate deals, more commonly known as land grabs. "Land grabs are processes by which wealthy private companies, real estate developers, and politicians collude to basically take a piece of government-owned land or common land and turn it into a for-profit venture. What happens in this process is that the urban poor and lower middle class might get evicted; they might have their claim to the land annulled or turned over," says Ranganathan. In Mumbai, for example, slum settlements are being demolished and their residents removed as real estate developers work with government officials on new land laws and land policies that allow profitable high-end apartments to be built. Similarly, in Bangalore, a bustling city that has benefitted from and developed through outsourced technology jobs, protected wetlands are at risk of being turned into hotels, malls, and upscale apartments. "Land prices are going through the roof," says Ranganathan. "Various city agencies do what they can to entice and accommodate real estate developers, who might be getting investment capital from Dubai, Singapore, or elsewhere." While many land transactions are legitimate, there is a fair amount of speculation, strong-arming, and land grabbing. These land grabs happen every day in growing cities, where land is "the quickest buck to be made." But after years of falling victim to backdoor, shady, and collusive deals, citizens are now speaking out and organizing in response to the increasing inequality-and they're calling it something new: corruption. 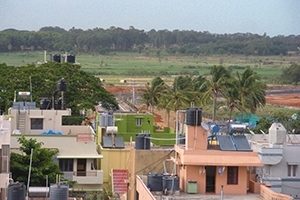 "They're having these town hall-type meetings inside the slums and bringing together activists, lawyers, and journalists to call out real estate developers and the government under the banner of corruption, and say that this move to try to evict slum dwellers without sufficient compensation, and put up high rise condominiums is actually a form of corruption," says Ranganathan. While the term is a new development when it comes to land grab issues, it has proven a powerful tool in other areas, notably political campaigns and populist slogans. In a recent Society + Space article, Ranganathan and Doshi explain that Donald Trump successfully wielded stories about corruption-e.g. "drain the swamp" and "illegal voters"-during his campaign to deflect questions of his own murky business dealings, which ultimately helped him win the election. "Any study of corruption cannot be complete until you see that how you define corruption is subjective, rooted in peoples' abilities to tell powerful morally-charged stories," says Ranganathan. To that end, she and her collaborators will travel to Mumbai and Bangalore to collect first-person accounts and stories of land grabs from slum dwellers, residents, activists, developers, newspaper clippings, and more to see how they define corruption and use the word in transformative ways. To deepen the story-telling aspect of the project, Professor Pike will examine how similar stories of corruption in urban regions such as Lagos, Rio de Janeiro, and Bogotá are depicted in literature and films. "I think films provide a gritty, realistic portrayal of what's going on in the world. We have a lot to learn from literary and visual approaches in the humanities," says Ranganathan. Ultimately, their interdisciplinary and collaborative work will culminate in a book and a visual website with examples of photos, stories, and videos of corruption stories. Ranganathan is hopeful that their final products will reach an audience from activism to academia and demonstrate how language is a powerful tool in creating change: "We have to pay attention to how the word 'corruption' is used over different time periods, to the malleable nature of corruption talk, and to how political leaders around the world can use corruption charges against others while absolving themselves of their own corruption charges."